President Donald Trump accused the “dishonest” press of failing to report on terrorist attacks, and later his administration tried to prove it by compiling a list of 78 “under-reported” terror incidents, including the high-profile (actual) massacres in Paris, San Bernardino, and the Orlando night club, as well as the truck rampage in Nice. Thursday afternoon, CNN’s Jake Tapper pressed White House aide Kellyanne Conway about the Trump administration’s misleading statements on terror coverage — and that was just the start. Tapper pushed Conway over and over again on the administration’s sustained assault on the media, why Trump didn’t tweet about the allegedly right-wing-inspired Quebec terror attacks, Trump’s falsehoods about America’s crime rate, Conway’s “Bowling Green massacre” comment, and the administration’s apparent disregard for the truth. It was a doozy. Conway admitted that CNN did “amazing coverage,” but indicated it was the “other ones” on the list that Trump was really talking about. “I think he’s making two points here. One is that we just can’t allow ourselves to become inured to terrorist attacks, to see it as the new normal.” The second point, Conway explained, was that there was too much coverage of other things, like candidate Trump during the GOP primary, and also Prince. “Your spin about the idea that we don’t want to be inured to that, that’s a lovely spin. But that’s not what he was saying, Kellyanne. He was saying that the media does not cover these stories because we don’t want to cover them because we have some sort of agenda. That’s what he was suggesting,” Tapper responded. “I know he’s sympathetic to any loss of life,” Conway said of the president. “It needs to stop no matter who is lodging the attack. We are of course very sad about loss of life here.” She added, “He doesn’t tweet about everything. He doesn’t make a comment about everything,” before jumping to Trump’s travel ban. Tapper continued to hammer his point that Trump and his administration were deliberately trying to skew facts and undermine the media’s credibility “except for certain supportive outlets,” pointing to the president’s wholly untrue comment Wednesday that the murder rate in America was the highest it’s been in 47 years. “He said nobody in the media reports on that. There’s a reason nobody in the media reports on that. It’s not true. The murder rate is not at the highest rate in 47 years. It spiked a little, it went up a little, but it’s still much, much lower,” Tapper said. Conway dodged the question. “Well, Jake, if I can take the broader issue of our relationship with the media. I’m among, if not the most, open press person in the White House, I’m now being attacked by the media, including networks that are familiar to you. I’m just going to keep soldiering on,” she said. “I came to this White House to serve this president who’s serving the people.” She then went on to a deliver a word salad about veterans. 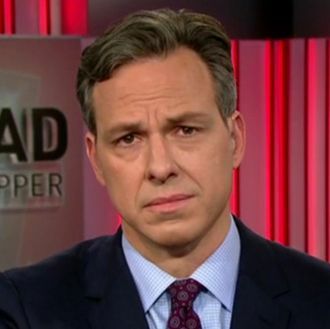 “That’s not addressing what I just talked about,” Tapper replied. “What we’re talking about is how the White House is waging war on people who are providing information.” He added that he’d much rather be covering veterans’ issues — or immigration, or trade, or, really, anything else. Later, Tapper tried again to grill Conway about the White House’s attempts to undermine the media’s credibility. Finally, Tapper bluntly asked, “Are we fake news, Kellyanne? Is CNN fake news? How about the president’s statements, Kellyanne, how about the president’s statements that are false? Like the murder rate is the highest it’s been in almost half a century? False. How about the fact that media doesn’t report on terrorist attacks? False. You can talk about some jerk with some website making a mistake, or almost making a mistake … you can talk about someone almost making a mistake and not doing it. I’m talking about the president of the United States saying things that are not true. Demonstrably not true.